Sling TV is one of the most popular live TV streaming services available with some of the cheapest prices in the industry. They’ve done away with the traditional one-size-fits-all model common to television services and created a highly customizable streaming service. Sling TV’s mission was to give consumers complete control over the shows that they watch. Sling TV is just one of the many television streaming options for people who are ready to cut the cord on their cable boxes. But are they right for you? *As reported by comScore, an American media analytics company, in April 2017. Since Sling TV offers customizable streaming services, choosing your plan may be a little different than you’re used to. You select a base service and then add extra channel packages on top of this. 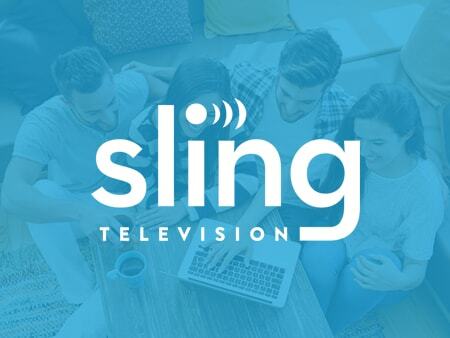 Sling TV offers just two streaming services to make your choice simple. These options are Sling Orange and Sling Blue. Sling Orange is a single-stream service so you’ll only able to stream your channels on one device at a time. With this package, you’ll get access to 30 channels which include Disney Channel, AMC, HGTV, CNN, and ESPN. However, you will miss out on some popular channels like NBC, FOX, and NFL Network. Sling Blue is a multi-stream service that will allow you to stream from three devices simultaneously. This makes it a better option for family-based households. Additionally, Sling Blue offers over 40 channels including NBC, FOX, NFL Network, and regional sports. The channel line-up from Sling Blue does overlap with Sling Orange to an extent. With Sling Blue, you will have access to some channels that aren’t available with Sling Orange. However, you will also miss out on a few that are only available through Sling Orange. This is unusual for a streaming provider, as higher tiers usually contain all of the products in the lower tier. Just remember that if you opt for Sling Blue alone, you won’t have access to ESPN or Disney channels. Instead, you can subscribe to both Sling Blue and Sling Orange to enjoy all of their base channels. You can get these plans at a discounted price of $40 when you purchase both together. This combined service will also give you a maximum of four streams at the same time. More specifically, you’ll be able to stream Sling Orange channels on only one device at a time and Sling Blue channels on three additional devices. Note that regardless of which service you choose, Sling Orange, Sling Blue, or both, you will be able to stream HBO content on up to three different devices at the same time. Just keep in mind that premium channels like HBO will set you back an extra $15 per month. When it comes to channel variety, Sling TV has fallen a bit behind other live TV providers. For comparison, DirectTV Now provides a larger number of channels in their cheapest plan. But this also means you’ll be paying for channels that you may not want. This is exactly what Sling TV is trying to avoid by offering fewer channels at a lower price. Sling TV offers extras for expanding your streaming choices. Sports fans may be interested in their Sports Extra while Families may want to look into the Kids Extra. These Extras are packages of channels in a certain category for an additional $5 each per month. For example, the Sports Extra includes channels like NHL Network, Golf Channel, and NFL RedZone. Additionally, Sling TV has a Comedy Extra, News Extra, Lifestyle Extra, and Hollywood Extra available. Their “4-Extras Deal” will let you save money by subscribing to four packages for just $10 instead of $20. However, you won’t be able to pick your own extras. This is a pre-built package that includes the Kids Extra, Comedy Extra, News Extra, and Lifestyle Extra. Before you can start enjoying your favorite shows with Sling TV, there are a couple things you’ll need. First, you’ll need high-speed internet access to stream videos with Sling TV. If you’ll be streaming on multiple devices at the same time, then it’s recommended you have a constant internet speed of at least 25Mbps. If you’ll only be streaming video content on one device at a time, then you’ll only need about 5Mbps speeds. Sling TV can be streamed on most smartphones, tablets, computers, or streaming devices. You can stream on a Windows computer or on your MAC OS through Google Chrome. You’ll even be able to stream your channels on an XBOX One. Unlike traditional television, you can stream Sling TV on your device no matter where you are in the United States, making it easy to watch your favorite shows when you’re on the road. For those of you that don’t have a supported streaming device, don’t worry. Sling TV will throw in a free Roku Express when you sign up for two months of their service. This device will allow you to stream Sling TV to any television. Sling TV may be the best provider for Latino or International streaming. They make it unbelievably simple to access a range of channels in various languages. You can either pay $10 per month for Latino channels on their own or add it to your Sling Orange or Sling Blue service for an additional $5. Sling TV also provides a range of international channels in various languages such as Hindi, Cantonese, French, German, and Mandarin. Just pick your language and choose your channel pack. These international packages start as low as $10 per month but you’ll find that most are in the $15 to $20 price range. Looking to integrate your local channels into your streaming service? Sling TV can do this too, with their AirTV Player. The device allows you to stream Sling TV channels alongside your local channels, as well as connect to Netflix. The AirTV Player is optimized for Sling TV and will provide a seamless streaming experience. Importantly, it supports 4k Ultra HD. The AirTV Player will cost you $129.99 at regular price. This may sound expensive, but it’s the only major streaming device that can also give you access to local channels. All you have to do to set it up is connect the device to your antenna. Once connected, you can stream local channels wirelessly to any device in your home. Don’t have an antenna? You can get a free indoor antenna from Sling TV when you pre-purchase two months of streaming. What’s more, the AirTV remote can be voice controlled. It also contains a special remote finder feature, so you won’t lose your remote in the couch cushions ever again. Since Sling TV is live, you’ll be watching your shows as you would with a cable box, commercials and all. You will be able to pause, rewind, and fast-forward through some shows but not all of them. This sets it back as a contender against commercial-free streaming services like Netflix and Hulu Premium. Of course, other live streaming services such as DirectTV Now also have commercials. It’s the price you pay for live television. If you’re used to recording shows to watch later, then you’ll want to pay the extra $5 for Sling TV’s Cloud DVR. This allows you to store up to 50 hours of content to watch later. But before you get too excited, keep in mind that a large chunk of Sling TV’s channels cannot be recorded. These are namely all Disney and ESPN channels or on-demand only channels. Since the DVR uses cloud storage, you won’t be able to watch recordings offline. If you’re still on the fence about Sling TV, you can try out their service with a 7-day free trial. Test out either Sling Orange, Sling Blue, or both. Add any extras you want during these seven days, so you can get a good idea of the channels you’ll have access too. No one likes being stuck paying for services they no longer want. With Sling TV, you can cancel your account any time you like without being tied to a contract. When you cancel, you’ll continue to receive your current paid subscription until your renewal date. Just remember that you won’t be refunded for prepaid subscriptions. It’s always important to know where you can go when you run into issues. Whether you’re having trouble setting up Sling TV on your device, or you’re trying to install your AirTV player, support is available to help you out. The company hosts a comprehensive help page complete with FAQ’s, useful articles, and how-to videos. This page will answer most questions you have about their services or getting started. If you’re still feeling stuck, you can contact their customer care team via live chat or phone call. On their contact page, they’ve displayed a helpful graphic with their most popular call and chat times. That way you can contact them during the hours when their lines are less busy. Some of the best reasons to choose Sling TV are their customizable channel selection, affordable Cloud DVR, local channel integration through the AirTV Player, and a wide selection of international packages. With two simple base services to choose from and an inclusive selection of extra channel packages, Sling TV offers budget live television streaming for the shows you want to watch. Their services allow you to save money by cutting out unwanted channels and service fees. Of course, once you start adding a lot of extra packages or choose the Sling Orange + Blue base package, your monthly price will climb beyond the advertised $20 per month. Regardless, we love their no-contract approach and the fact that you can cancel anytime. You don’t even have to purchase additional devices to use their services. 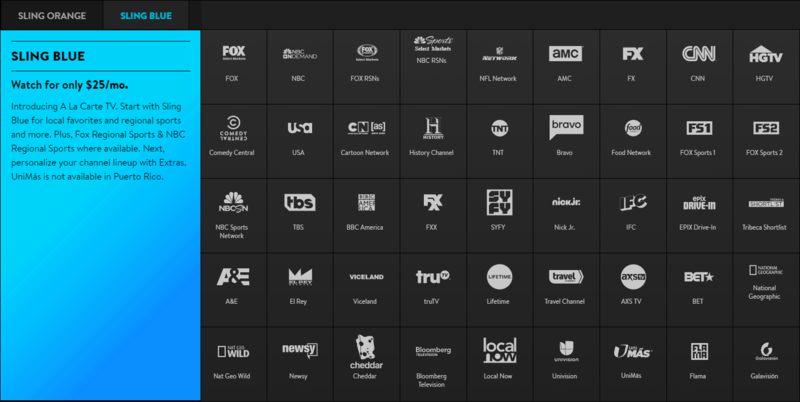 Sling TV is definitely worth a try if you’re paying for loads of unwanted channels with your current TV provider for just a handful that you actually watch. Have a look at the channels included in Sling TV’s two base plans and take them up on their free trial offer. I like Sling compared to DIRECTV Now, way less expensive. It’d be nice to have locals everywhere though. No SERVICE for US folks working/serving overseas. I am using Roku with sling tv. Sling had a special when you pay for 2 months you get a free Roku Express. I absolutely love it. The remote is simple and set up was very fast. I watch movies on a variety of websites so even though the tv was all I was really after sling offers movies as well. Roku is also a great addition for additional movies. I am using wifi in most rooms and all are hooked to HDMI and USB to my TVs. I get 1080p on every channel. Fast, flowing, uninterrupted tv just as I wanted. One downside is that I have no local channels or weather channel but hey, that’s what the internet is good for right? I can use my phone or PC for that. I have heard that local channels and some major networks may be coming in the future, things like ABC, NBC, etc. My area just doesn’t offer it yet. Someone else’s may. For my wants and needs, this combo was near perfection. I have Roku with sling TV in every room in my home that has a TV. I highly recommend this combo.